FAYETTEVILLE, NC (WTVD) -- It took 71-year-old Patricia Martin 45 minutes get herself free from duct tape and call police Tuesday morning. It only took a few minutes for a stranger to invade her home, hold her at gunpoint, and steal her money and car. "Nobody should have to go through something like that," said Martin. "I'm just so fearful." Martin, a HuntLeigh Court resident, is one of three people victimized by a man Fayetteville police describe as a serial home invader. He struck all three homes within 18 hours on Monday and Tuesday. In each case, police said the man took the homeowners' firearms. In two cases, they say he stole the victims' cars. "We believe he's armed at this point," said Fayetteville police Lieutenant Mike Geske. "We believe he's acting erratically, but now he's escalating to how he's treating his victims." On Tuesday afternoon, Fayetteville Police announced the search for the suspect, who all three victims described in the same manner. He's described as a white man in his early 30s, between 5'7 and 6'0 tall, and weighing between 150 and 170 pounds. The victims also said the man had a long, dark ponytail and goatee. Martin said he came to her home wearing a cowboy hat. "He doesn't come out of nowhere," said Fayetteville Police Lieutenant Mike Geske. "Somebody knows who this guy is." 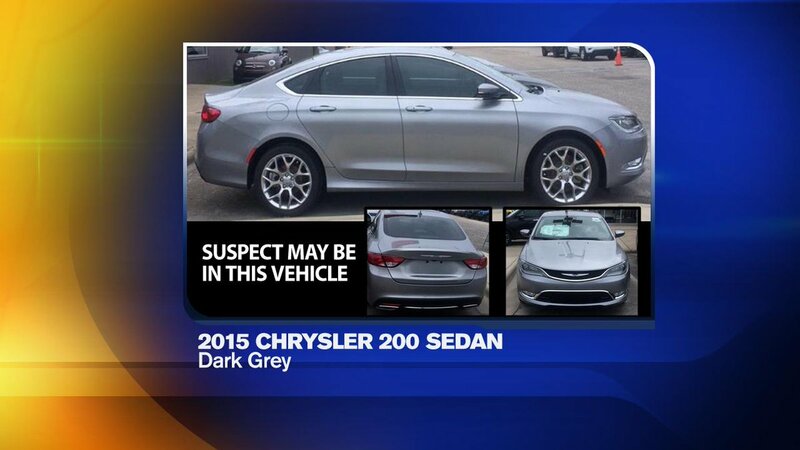 Geske said the suspect is believed to be traveling in Martin's dark gray 2015 Chrysler 200. It has a NC license plate AEP 2319. Authorities said the man first walked into a McPhee Drive home around 5 p.m. Monday evening. The 50-year-old homeowner walked in on the suspect, who walked the victim around the home, before taking off with his wallet, phone, handgun, and 2011 Ford Fusion. The car would be recovered nearly six hours later, along the 6400 block of Yadkin Road. That was after a 10 p.m. home invasion on Durden Lane where police said the suspect knocked on the door and entered as the 69-year-old homeowner loaded his rifle. That gun would also be stolen. Police said the suspect resumed the home invasions at 8 a.m. Tuesday morning, when he stood at the front doorstep of Martin's home, asking for help. Martin said she was changing into her gym clothes when she heard her neighbors' dogs howling at the front door. She opened the door to find the scruffy man asking for money, a drink, and the keys to her car. She refused and tried to call police. The next thing the 71-year-old woman knew, she had the barrel of her own gun pressed against her back. "He forced me into the bedroom where he slammed me into the wall and he was choking me," Martin recalled. "He taped me up hand to foot and he stole my car and left," she said. The suspect also stole Martin's husband's watch, $800, and her handgun. Police said the man has .380 and .357 handguns and a shotgun from the three homes. "Hopefully he's gotten rid of them, he's sold them, but we believe he's armed at this time," said Geske. " Mike Lecka's neighbor was the victim of the first home invasion on McPhee Drive. He'd used Lecka's phone to call police. "I have guns," said Lecka said. "I have a Holmes Electric burglar alarm system and it's instant on so be ready." The suspect is considered to be armed and dangerous. Anyone with information regarding the suspect's identity or the home invasions is asked to contact Detective M. Quillen at (910) 237-4675. Information can also be submitted by calling Crimestoppers at (910) 483-TIPS (8477) or by visiting http://www.fay-nccrimestoppers.org/send_a_tip.aspx and completing the anonymous online tip sheet or by text-a-tip on your mobile device by sending a message to 274637 (in the text box type "4Tip" followed by your message).